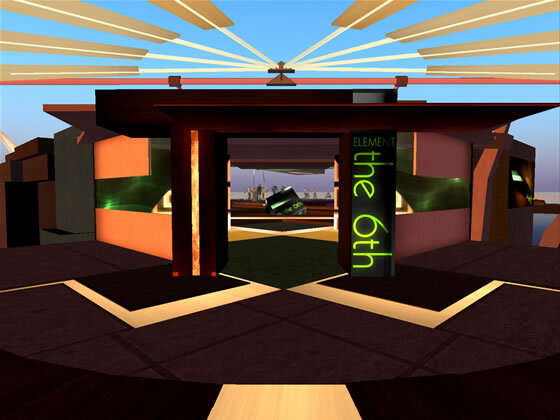 SLENTRE.COM » Second Life Club Profile: Popular SL Club – The 5th Element – Gets a Makeover! 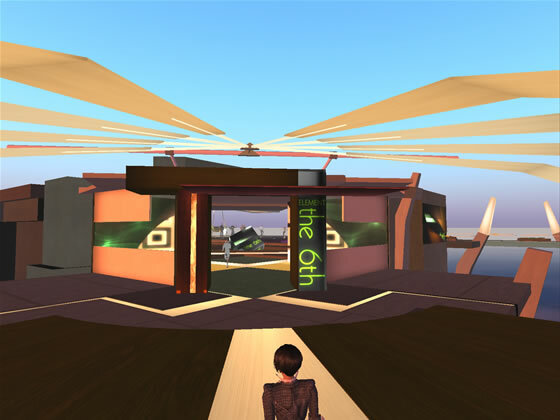 Second Life Club Profile: Popular SL Club – The 5th Element – Gets a Makeover! One of Second Life’s most popular clubs and Traffic Report chart toppers received a major makeover over the past weekend. The 5th Element, owned by designer and builder Dakota Neumann, has transformed into it’s next iteration as The 6th Element. Despite the fact that this wildly popular SL hangout was already fully functional and beautifully designed, Dakota prides himself on updating the club’s look and feel every 6 months. 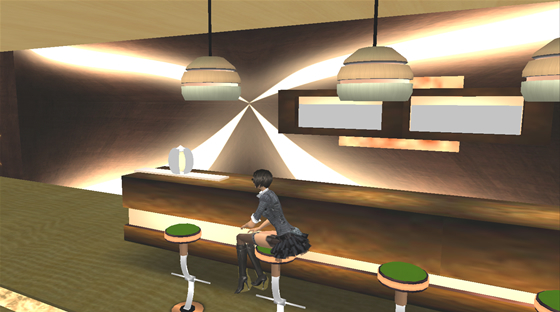 You can now see the newly designed club at the old location – http://slurl.com/secondlife/GOL%208/128/128/2. Dakota Neumann: As GOL tradition, I replace the Club with a new one every 6-8 months. The reasons behind this are: first of all, it’s important to always provide something new to our patrons; this keeps the attention alive and people don’t get bored too quickly or easily. This applies to club staff too. Element staff are very dedicated and they spend a huge amount of time in the club. It’s nice for me to offer them new places and it offers a way for me to make them feel that Element is a never-ending process of evolution. They all know that a 7th Element will arrive sooner or later. Element staff is one of it’s secrets; we’re a team of amazing, talented and dedicated people. Finally, I get bored of the design quite easily and this compels me to experiment with something new. MB: When designing a space for your club, what are the primary goals and considerations? 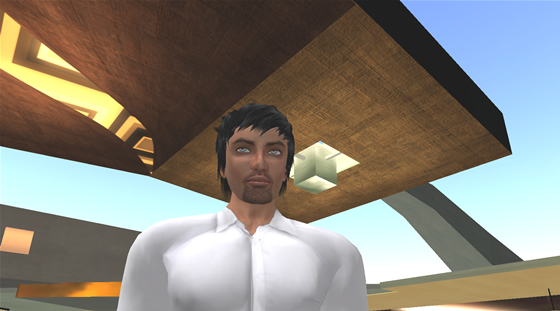 DN: In SL, people react differently when they’re in a building than they would in RL. They don’t use many rooms, they tend to gather in one place and the perception of space is very unique to the program. All this has to be taken into consideration when building a public high traffic space like a club. My first clubs were very big, with many hidden spaces and different rooms. However, I noticed that most rooms were never used. What I do now is to allow an easy flow to the main dance area. This must be large enough to allow patrons to dance easily and to provide enough space all around for those who prefer to watch. This is essential. Of course it would be quite a boring place if it was just an entrance and a dance floor, but simplicity is the rule. All this must be taken into consideration but the general design and style is influenced very much by my inspirations and my mood at the time building starts. 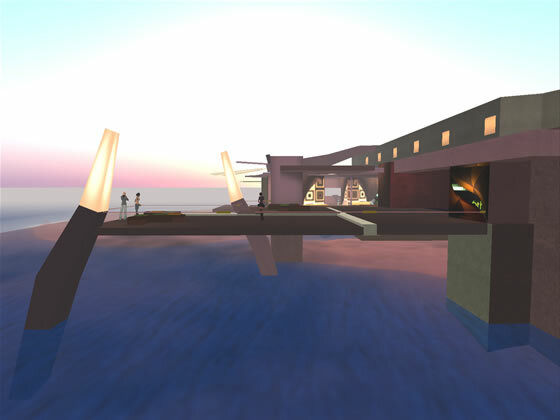 Any high traffic place in Sl is going to be laggy so I’m very careful to build a “clean” structure – meaning no scripts nor oversized textures and the sim is totally empty except for the club. Unfortunately, 70-80 people loaded with scripts will always bring lag with them. MB: How does this new build differ from the last one? DN: This new club has a different design; it has 70’s/80’s flavours plus some influences from recent Asian modern design clubs. The textures are much more sophisticated and the lighting effects more carefully done. Also, the dance area is closer to the entrance. MB: How long did this new design take to build out? DN:It usually takes me about 1 month to build a new club, but it can take longer if I’m not satisfied with what I’m doing. MB: Describe your creative process – do you do any actual sketches of your concept? What is the most time-consuming part of the build? Textures? Construction of prims? Do you create any shapes outside of Second Life? Which programs do you use? DN: I don’t do any sketches. It’s usually all in my mind as a design idea that I have that as I said is influenced by many factors. I see it all done before doing it, but what happens all the time is that while I build, I change many details. It’s an exciting process of changing and trials and all of sudden I realize I got the general design right. Then I usually take a few days break, come back to it, modify it a bit again, and start going into texturing and detailing. The texturing is obviously very important; it takes a long time to achieve the desired effect and it is what gives the place atmosphere. I generally like warm tones, and each texture is prepared to enhance the sensation of space and depth. I dont use any RL programs for the prims – just Photoshop and an Autodesk software for the textures. MB: Describe how you choose the colors for your designs. How do you create your color palettes? DN: Colours give me deep emotions in Rl too. I dont like primary colours – nor glowing effects too much. Deep shades of purple and reds are always present somewhere in my Clubs, and lights and shadows tend to be dramatic. MB: It’s rumoured that the American Architect – Frank Lloyd Wright – has been an influence on your work. Is this true and if so how/why does he inspire you? DN: Well, FLW was a genius. And most of his houses and buildings still look amazing and modern even after all this time. His use of space, the sleek elegance of the structures and the way he uses volume are breathtaking. 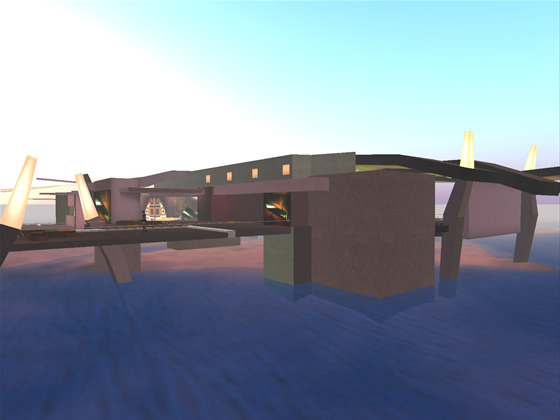 I’m not a RL architect; I’m just an architecture lover and in SL I’ve found a place where I can make my ideas real. I try to do my best because it’s my passion and I’m happy when people like what I do. I’m inspired by everything I see. I’m a curious person and I love beauty in all forms. MB: How do the residents that go to the club react to the new designs in general? How have they responded to this design in particular? DN: I’m very lucky because people seem to appreciate what I do. I’m always nervous when I first show my work to someone. Have I got it right or wrong? I’m always happy when I finish a work, but it would be useless if no one else would like it. They seem to like this new Club too – fortunately. MB: How soon will you start on The 7th Element? DN: Hmm, I guess I will start working on it by next June. MB: Does your club make money? It’s one of the most popular clubs in SL but I am sure the cost to run the place is substantial. Do you accept advertising on the sim? What other ways have you considered monetizing the club? Or do you NOT run the club for a profit? long as I am in Second Life.